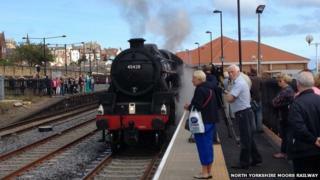 North Yorkshire Moors Railway's second platform at Whitby station has officially opened to the public. The charity launched its new timetable with the first steam train arriving into the station at 09:44 BST. The railway operates steam trains on its line between Pickering, Grosmont and Whitby. It said the number of steam trains serving the seaside town would increase from three to five each day during the spring, summer and autumn months. The platform was built at a cost of nearly £2m and was funded by Network Rail and the government's Coastal Communities grant. The railway hopes it will see an extra 30,000 passengers at Whitby every year, generating an annual £6.5m for the local economy. On Tuesday, the heritage railway charity carried out a test run of its new platform with 400 passengers onboard one of its trains ahead of its officially opening.